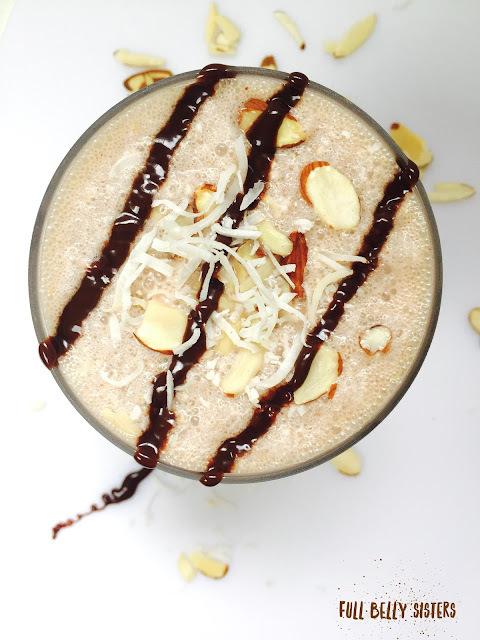 Chocolate, coconut, and almond in an easy smoothie! 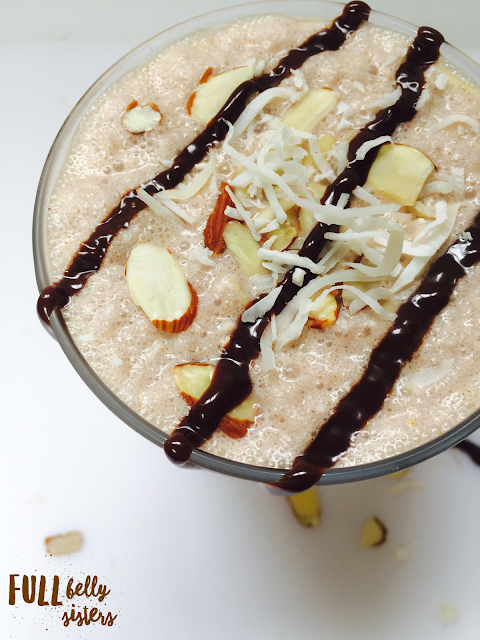 This healthy almond joy protein shake is fantastic for portable energy. Somehow, summer seems even busier than the school year. Running around to camps, playdates, afternoons with buddies at the town pool, sports. I don't know. It always seems like we're going to have all this down time but then we end up hauling from one (admittedly fun) commitment to another. Between the busy schedule and the hot weather, smoothies really come in handy: they're packed with filling protein and they're super refreshing. Plus, you can whip 'em up fast! I usually make shakes in my blender. But sometimes there's not even much time to do that! That's where the new Thermos® #ShakerBottle comes in quite handy. The 24-ounce bottle is leak-proof, BPA-free, and has an integrated mixer—kind of a whisk—that helps blend your ingredients and ensures you don't get clumps of protein powder in your shake. Thermos® is having a giveaway for these cool bottles: go here to enter! Pour the milks into the Thermos® #ShakerBottle. 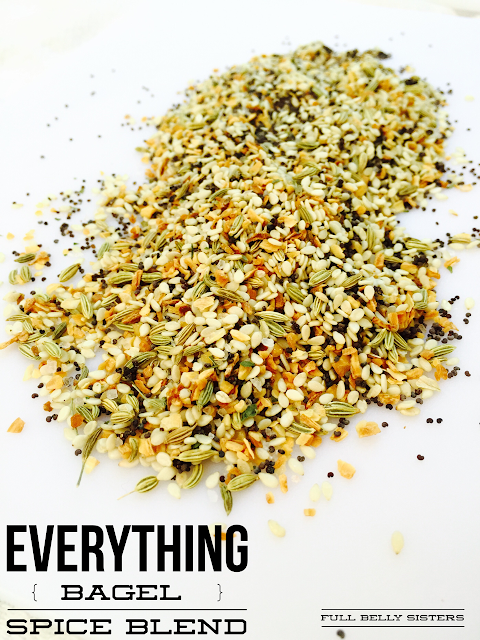 The bottle has capacity markings, which is great when you're pouring in your ingredients—no need to use separate measuring cups. Add the shredded coconut and almond butter. Then add the protein powder. (When you are adding all of the ingredients to the shaker bottle, be sure to add the protein powder last. This ensures that the integrated mixer will blend it all in smoothly.) Place the integrated mixer in the shaker bottle and screw on the bottle top. Shake for about 30 seconds, or until the ingredients are blended together. Add crushed ice, if you'd like. Drink up! If you prefer to make this smoothie in your blender, try blending it with about a cup of ice, until frothy. Cool and creamy! Then just pour it into your Thermos® #ShakerBottle and take it with you: the bottle is perfectly portable, with a locking, push-button lid to protect it from spilling. 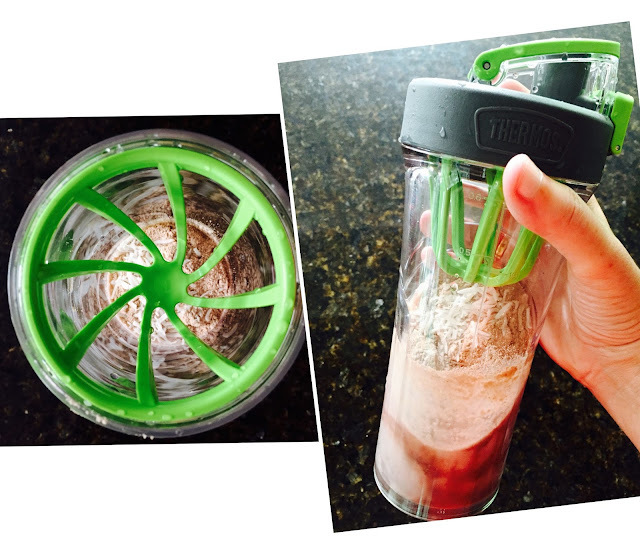 The shaker bottle is also super easy to take apart and clean in the dishwasher. I love that there is no impossible-to-effectively-clean straw. And the bottle fits into my car's cup-holder! My almond joy protein shake, heading out the door with me. Wouldn't you love one of these shaker bottles? Thermos® brand is offering you a chance to win a Genuine Thermos® Brand Shaker Bottle through a sweepstakes hosted on the Thermos® brand Facebook page. Head on over and enter to win now! You can find also Thermos® brand on Twitter, Pinterest and Instagram. Wow, that looks delicious!! And the Thermos bottle looks very cool too...will definitely have to check that out! Hope you enter--and i really hope you win! This sounds so good, Justine! I'm going to have to give it a try, it would be a perfect snack after a workout! AWESOME shake and that cup!?! LOVE IT!! I do, too, I'm using it all the time! 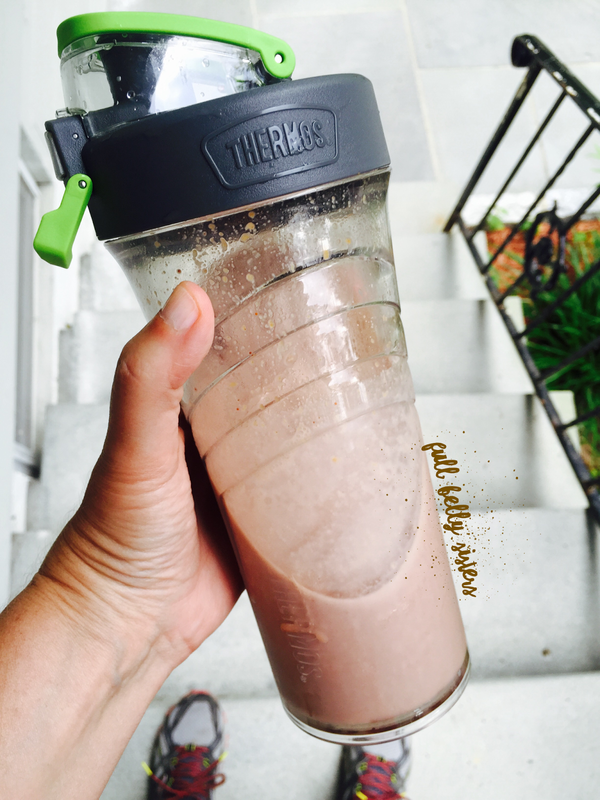 Love the flavors in this shake and that Thermos bottle would be perfect to bring to the office! It's so portable, I love it! I feel inclined to go work out right now and make a shake afterwards!! LOVE that bottle! The girls at work would love to have one. They all are on some kind of powder drink diet. I would love it to mix up my smoothies for breakfast. And I love an almond joy, so I'm all over this shake. Mmmm, this looks really tasty!!! Perfect for these scorching temps! Almond Joy candy bars are my favorite! They also have one from England called a Bounty bar and it is just delicious! I will love having this for breakfast!! This is a perfect energy drink that sounds tasty!